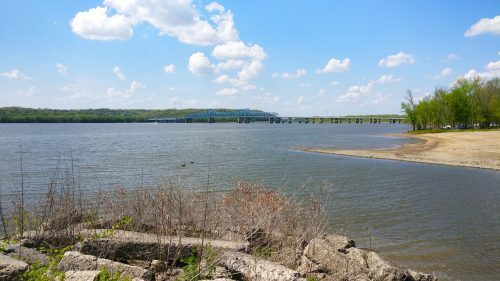 Shaped by ongoing and often dramatic changes, the productive and beautiful Illinois River Valley sustains richly varied natural and human communities. Driving the Illinois River Road National Scenic Byway, the region's astonishing biodiversity reveals itself to travelers. Raptors, waterfowl, songbirds, deer, and a host of other wildlife species grace the landscape's mosaic of wetlands prairies, woodland seeps, hardwood forests, and scores of other natural communities. Winding alongside the wide Illinois River, the abundance of the river and its valley is evident at every turn. Long rows of corn and soybeans green the countryside, barges carry commodities up and downstream, roadside stands sell fruit and vegetables, and anglers cast into the river's slow-moving waters. Along the route, you'll continually encounter the long human legacy of this landscape, the accumulated cultural history of Native Americans, French explorers, American settlers, and immigrants who were drawn by the river valley's abundant natural resources and who built their lives and communities from the land and river. Throughout the region, the landscape tells a story of continual changes that shape every aspect of this region-from its age-old geologic formations to the path of the wide and winding Illinois River itself.